The Minnesota Vikings, under Head Coach Bud Grant, had been the dominant team in the NFC Central division throughout the decade of the ‘70s (indeed, since 1968), but there were question marks surrounding the club leading into the 1979 season. The Vikings had won the division title for the tenth time in eleven years in ’78, but with only an 8-7-1 record; they had been easily dispatched by the Rams in the opening round of the playoffs. Furthermore, star QB Fran Tarkenton had retired in the offseason and third-year QB Tommy Kramer (pictured above) was taking his place in the starting lineup. 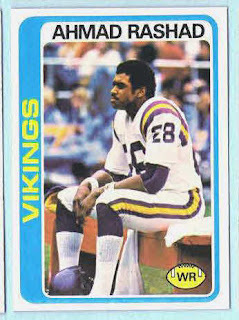 The 6’2”, 200-pound Kramer had been drafted out of Rice in the first round by the Vikings in 1977 with the expectation that he would be Tarkenton’s heir. There was little question regarding his arm or confidence, but Kramer had seen little action in his first two years, throwing a total of 73 passes for 475 yards with five touchdowns and five interceptions apiece. However, he had experienced wide receivers in Ahmad Rashad and Sammy White, as well as RB Rickey Young, an outstanding receiver out of the backfield who had led the NFL with 88 catches in ’78. The Vikings hosted their season-opening game on September 2, 1979 against the San Francisco 49ers at Metropolitan Stadium. While Minnesota was in transition, the 49ers were in full rebuilding mode after coming off of a miserable 2-14 season. They were under the guidance of a new head coach/GM, Bill Walsh. Neither team generated much excitement in the first half. Ray Wersching kicked field goals of 37 and 22 yards in the second quarter and the 49ers clung to a 6-0 halftime lead. Wersching booted another field goal, of 44 yards, in the third quarter before Kramer connected with Rashad for a 52-yard touchdown. The young quarterback threw another TD pass to Rashad, covering 32 yards, before the period was over to give Minnesota a 14-9 lead. A third Kramer to Rashad touchdown pass play, for eight yards, gave the Vikings a 21-9 fourth quarter lead, but it did not prove to be a comfortable one. 49ers QB Steve DeBerg threw a 44-yard TD pass to WR Freddie Solomon, and when RB Lenvil Elliott ran for a four-yard touchdown, San Francisco was back in front by a 22-21 score (the extra point attempt failed following the second TD). With 17 seconds remaining on the clock, it was Kramer to Rashad once more for the winning 25-yard touchdown, although the 49ers claimed the wide receiver didn’t have possession when he crossed the goal line. An apparent forward fumble had been recovered in the end zone by fellow Vikings WR Sammy White, and under a new rule should not have been a touchdown but rather Minnesota’s ball on the one yard line. It was a moot point – and there was no instant replay provision at that time – as the officials ruled that Rashad had crossed the goal line before fumbling. The Vikings won, 28-22. “I’m sick about the loss,” said Bill Walsh, whose head coaching debut had been marred by the late score. The game had indeed been closely fought. Both clubs had 22 first downs and turned the ball over twice, while Minnesota led in passing yards (287 to 254) and total yards (397 to 352). Both squads ran the ball 27 times, with the Vikings outgaining the Niners, 110 to 98 yards. Kramer had a solid outing, completing 21 of 34 passes for 297 yards with four touchdowns and no interceptions. Ahmad Rashad was of course the pass receiving star, with 7 catches for 152 yards and the four touchdowns. Fading veteran RB Chuck Foreman ran the ball the most times, with 11 carries for 33 yards, while Rickey Young was the team’s leading ground gainer with 43 yards on six attempts. Steve DeBerg, at the beginning of what would be a record-setting passing season, threw the ball 42 times and had 29 completions for 262 yards with a TD and two interceptions. Freddie Solomon, thanks to the long touchdown reception, led the 49ers in receiving yards with 107 on four catches, while FB Mike Hogan caught the most passes (7, for 39 yards). Lenvil Elliott topped the runners with 41 yards on 10 carries and the one touchdown. It was not the beginning of a rejuvenating year for the Vikings – they fell below .500 for the first time since 1967 with a 7-9 record that placed them third in the NFC Central. It was a harder year for the 49ers, who again went 2-14 and placed last in the NFC West; however, the groundwork was being laid for better years ahead under Walsh. Tommy Kramer placed second in the NFL in passes attempted (566) and third in completions (315), categories in which Steve DeBerg set new league records (578 attempts, 347 completions). Kramer’s 3397 yards and 23 touchdown passes were solid numbers, but he also tossed 24 interceptions (tied for first in the NFC with Tampa Bay’s Doug Williams). Ahmad Rashad led the conference in both pass receptions (80) and yards (1156) while scoring a total of 9 touchdowns.